San Diego routinely wins praise as a location for high-tech startups, but a new survey gives San Diego — and California in general — failing grades for friendliness to small businesses. According to a national survey of 12,000 small business owners by Thumbtack, a San Francisco-based online hiring service, California fell from its D grading in 2013 to an F in the 2014 survey. Out of the 82 cities rated for business friendliness, San Diego came in at No. 78. Six other cities in California — San Jose (68), Santa Rosa (70), Riverside (71), Los Angeles (74), Oxnard (76) and Sacramento (82) — were also ranked as some of the least business friendly cities. The survey found that California received low marks for its business, environmental regulations, and for its tax code, licensing, and zoning laws. California, however,received a favorable mark for the ease of hiring new workers. The study also found that some of the most important issues for business owners were business-friendly licensing regulations and the ease of filing taxes. “Thousands of small business owners across the country told us that the keys to a pro-growth environment are ease of compliance with tax and regulatory systems and helpful training programs,” Leiber said. Business owners who were aware of incentive programs offered by their local governments were more likely to rank their governments as being business friendly, the survey found. 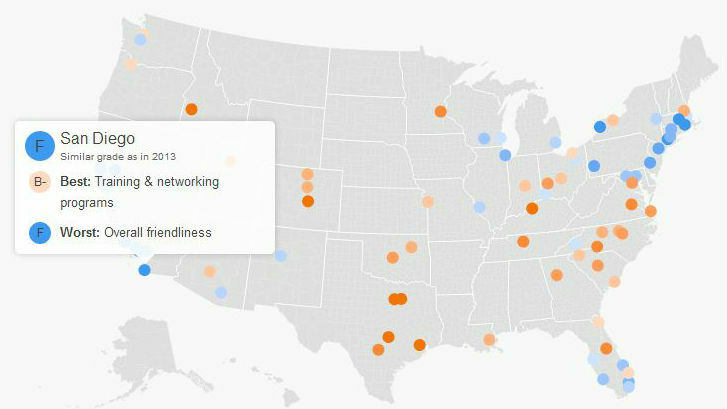 Utah, Idaho, Texas, Virginia and Louisiana were the top rated states for business friendliness. Among the lowest rated were Rhode Island, Illinois, California, Connecticut and New Jersey. The study was done in partnership with the Ewing Marion Kauffman Foundation.